It’s been a while since the last season of Ranked Battles swept the battlefield, and we’re ready to kick off a new one that ramps up the fun and excitement. You have provided us with tons of valuable feedback based on two Beta Seasons. 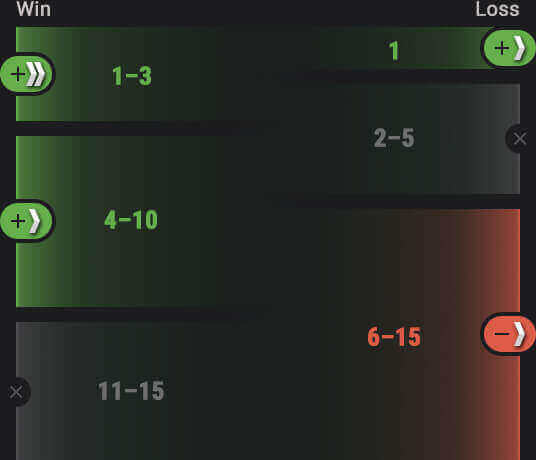 After thoroughly analysing it, we’re finally ready to launch Ranked Battles again. Test the new rules and let us know what you think! Starting from the next iteration, it’s all about turning the whole season into an action-packed chase. The new Ranked Battles season has just one stage, so there’s no need to play through the night to level up over a weeklong run. Now it’s you, 21 days, and the 15-rank ladder to climb. As you already know, there will be 15 Ranks in the upcoming season (the higher your rank, the better). Once reached, Ranks 1 and 15 are always with you, so you’ll never lose them. But the season will be long and intense, so we’re introducing a “shield” system that grants you protection when you reach a certain Rank. How it works: Ranks 5, 10 and 13 offer shields that let you keep your Rank, even if the rules say your rank should decrease. This will give you room for mistakes and allow you to collect your wits before the next push. The shields are not indestructible, though. After a respective number of defeats for each “safe” Rank, shields “break”, pushing you one step down the ladder. Remember that every defeat will lower the protection of a shield by one. However, a single victory will be enough to fully restore it. Chevrons are still your way to advance up the Rank ladder, and we’ve reconsidered their distribution to encourage the most aspiring tankers. At the end of a battle, chevrons will be given to the ten best players of the winning team and to just one exceptional tanker on the losing side. However, if you reach the Top 3 in a winning team, you will get an extra chevron. If you end up in the bottom 10 of a defeated team, you will lose one chevron. Ending up in any of the remaining positions will not change the amount of your chevrons, so you can exit the battle safely and have another go in the next fight. This will allow the best players to advance in Rank faster, providing an extra incentive to win. In a nutshell, this is how it looks like. To secure a place on the leaderboard, you need to earn at least 5 Rank Points, which means reaching Rank 5. Getting further isn’t as easy as it sounds. Just like it was before, you'll receive one Rank Point the first time you climb one rank. Once you reach Rank 15, it's time for your vehicles to do the work: every time your machine earns 5 chevrons, you get one extra point with 25 Bonds. And, starting from this season, you can check your position both in the game client and on our website. Special accolades will be handed out to those who participate in Ranked Battles, and just what they are depends on how successful your performance is during the season. So be prepared to step in as both an individual and as a team player! As long as the next season is a single heat, there will be no stage rewards. 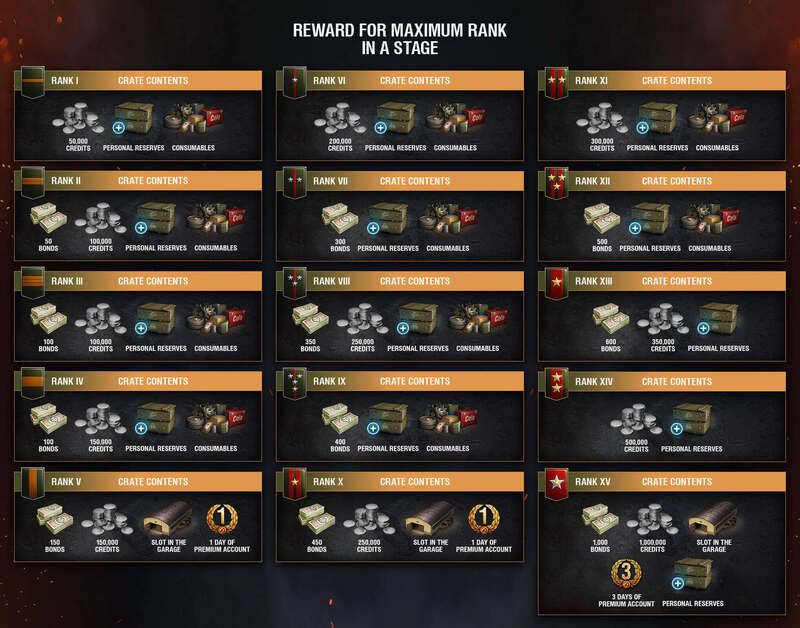 Rank rewards are still here, and they have been revised to become more worthwhile. Reaching Rank 9, for example, will grant you 1500 Bonds, with bigger numbers given for higher ranks. All in all, reaching Rank 15 will add 4,000 Bonds and over 3,000,000 to your wallet. Seasonal rewards will be updated, too, giving tankers their well-deserved Gold, Bonds, and days of Premium Account, while each league will receive its unique visual style and badge. Previous seasons have demonstrated that some of the maps aren’t the best fit for the specific requirements of Ranked Battles, so we’ve updated the list of available locations, removing Erlenberg and Swamp. We’ve designed these changes to make victories more fruitful, to reward the most efficient tankers, and to make the Rank distribution of players even more skill-based. Join the chase and share your thoughts on the forums!